until 1.000.000 €: 28.80% TTC. (24% HT). Major of 1.000.000 €:15% TTC (12,5% HT). Until 250.000 €: 28.80% TTC. (24% HT). From 250.001 to 999.999 €: 24%TTC. (20% HT). Major of 1.000.000 €:15% TTC. (12,5% HT). Artworks are submitted to a fix premium of 30% TTC. (25% HT). › › 20% of the additional charge for the watches and jewels. › › 5.5% of the additional charge for the artworks. The sale is subject to the French legislation and to the terms printed in this catalogue. It is important to read the following conditions. Useful information is given on the methods to buy at auction. Our team remains at your disposal to inform and assist you. Non-European buyers may have all VAT invoiced refunded to them, on the basis of the selling costs only, if they request so in writing to the accounting department within a delay of 3 months from the date of the sale, and if they provide Monaco Legend Group with the third sample of the customs documentation (DAU) stamped by customs. Monaco Legend Group must appear as a shipper on the export document and the buyer as the consignee. The exportation has to be done within the legal delays and a maximum of 3 months of the date of sale. The documents provided by the study “Monaco Legend Group” for the CITES articles of the species listed in the annexes A, B or C of the regulation CE338/97 are only valid in the EU. All the exits to a third country shall be subject to an exportation or reexportation permit granted by the CITES Management Authority. In the buyer’s country of residence. We advise you to approach the CITES Management Authority of the country of destination to obtain confirmation of the possibility of importing such articles. Some countries can prohibit the issuing of the documents according to their own specific legislation. These actions have to be taken by the buyer and at their own expense. Contact Monaco Legend Group for more information. The estimates are intended as a guide only. Any bid between the high and the low pre-sale estimates offers a fair chance of success. lt is always advisable to consult us nearer the time of sales as estimates can be subject to revision. The estimates set out in the catalogue do not include the buyer’s premium. We are at your disposal to provide you a detailed report on the condition of the lots. All lots are sold in the condition in which they were offered for sale with all their imperfections and defects. Dimensions, colors and weight of the products are provided for information purposes only and are not binding. No claim can be accepted for minor restorations or small damages. It is the responsibility of each prospective bidder to inspect each lot prior to the sale and to rely on their own judgement to aquaint with the characteristics and the potential repairs or restorations. No claim can be considered once the auction is pronounced. ›› Restored or repainted dials regarded as protective measures and not as vices will not be reported. The conditions of the bracelets and the water resistance of the screwed-back watches are not guaranteed, and neither are the deployment clasps and tang buckles. It is important to note most of the waterproof watches have been opened to identify the type and quality of the movement. ›› There is no guarantee the watches are still resistant to water and it is recommended to consult your watchmaker before using the item. ›› Dimensions of the watches are provided for information purposes only. ›› Absence of any indication of the existence of restoration work or of an accident by no means exempt the jewelry from having a defect. ›› Precious and semi-precious stones may have been subject to treatments with the intention to showcase them. (i.e: oil treatment of emeralds, heat treatment for rubies and sapphires, whitening of pearls). ›› These treatments are traditional and accepted by the jewels international market ›› Considering the rise of new treatments, the stones submitted to the auction with no certificates will be sold without guarantees about the treatment. ›› It shall be stated that the origin of the stones and their quality (color and purity of the diamonds) reflect the opinion of the laboratory issuing the certificate. No claim will be accepted in case another laboratory gives another opinion, and will in no way engage the responsibility of the auctioneer and expert. ›› The jewelry advertised in our catalogue as yellow-gold or white-gold with no hallmark are always in gold 18K, that is 750%Åã— Gold 14K: 585%Åã—Gold 9k: 375%Åã (Charts) ›› Relining, inlay work and varnishing are considered a protective measure and not a vice, they will not be reported. Dimensions are provided for information purposes only. Pre-auction viewing are open to the public. 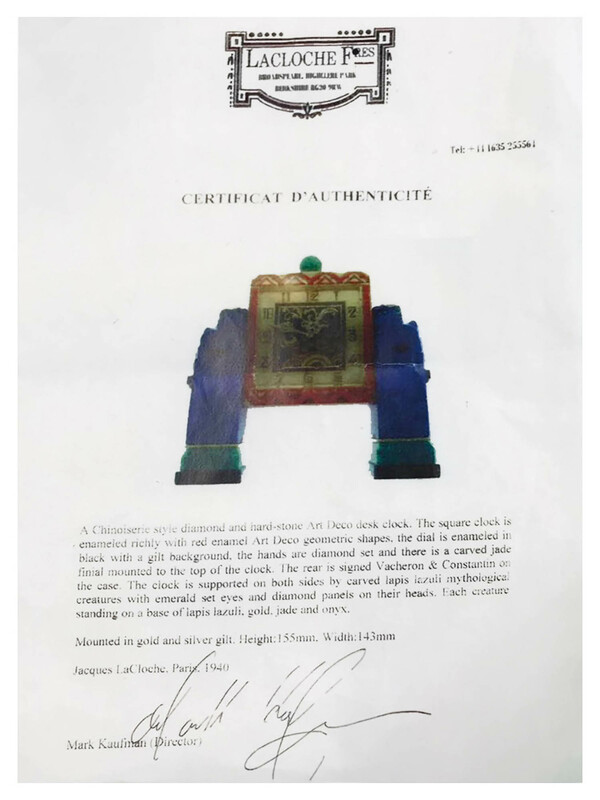 Monaco Legend Group is concerned for your safety while on our premises and we endeavor to display items safely so far as is reasonably practicable. Nevertheless, handling an object without the supervision of a member of Monaco Legend Group shall be at your sole risk. Bids can be executed in person, by telephone or by a third party. Auctions will be conducted in euros. A currency converter will be operated during the auction for your convenience, however, only the prices in euros will be valid. To bid in person in the sale room, you will need to register with Monaco Legend Group before the auction begins. Each bidder shall provide Monaco Legend Group their bank information and guarantees before the session. They will then be assigned a bidder number that will be necessary to authorize the sale. Should there be any doubts as to price or buyer, please draw the auctioneer’s attention to it immediately. If you make a bid at auction, you do as principal and you shall assume full responsibility for your bid, unless it has been previously agreed that you do so on behalf of an identified third party and you have produced a valid power of attorney acceptable to us. If you cannot attend a sale, we would be pleased to execute written and signed bids on your behalf. This service is free and confidential. Lots will be bought at the best possible price, respecting the reserves and other bids. In the event of identical bids, the earliest bid received will take precedence. Always indicate a top limit, unlimited bids and “buy at all costs” will not be accepted. Orders shall be made in euro. A bidding form can be found at the end of this catalogue. ›› Sent by e-mail at: info@monacolegendgroup.com ›› Hand delivered to staff on the premises ›› You may also bid by telephone, however, bids must be confirmed before the auction in writing. 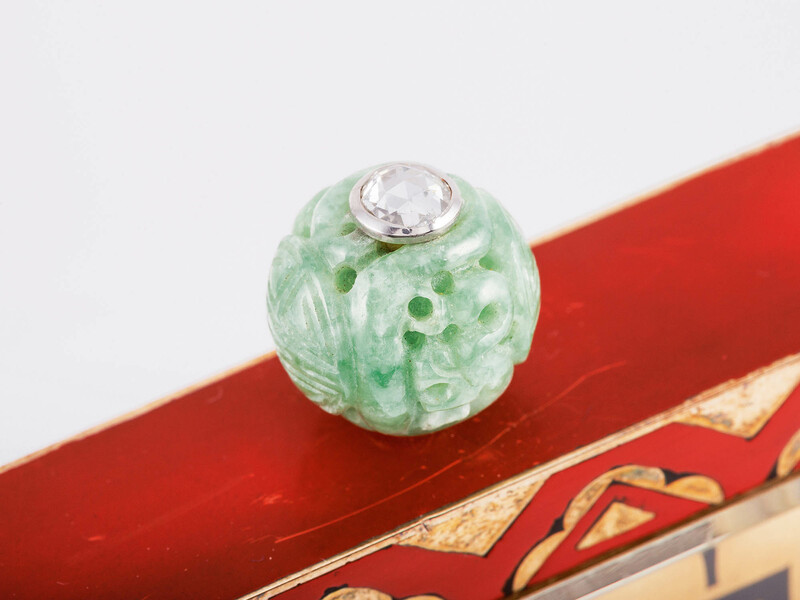 In order to guarantee satisfaction to the bidders, written bids must be received at least 24 hours before the auction. If you cannot attend the auction, it is possible to bid on the telephone. As the number of telephone lines is limited, it is necessary to make arrangements for this service 24 hours before the sale. We also suggest that you leave a covering bid which we can execute on your behalf in the event we are unable to reach you by telephone. The sale will follow the order of the catalogue. The auctioneer may commence and advance the bidding at levels he considers appropriate. The auctioneer is entitled to place consecutive and responsive bids for and on behalf of the vendor until the reserve price is achieved. Purchases can only be collected after payment. All lots can be collected during or after the session upon presentation of written consent from the Accounting Department of Monaco Legend Group. We recommend the buyers to take delivery of their lots after the sale. The French state is entitled to use preemption right on any works of art presented at the auction, by order of the Minister in charge of culture after the hammer stroke. The State shall have a period of 15 days from the date of the sale to confirm its preemption right. In case of confirmation, the French state shall be subrogated in the buyer’s position. Height 15,5 cm. At the time this clock was made, Lacloche Frères was considered one of the finest jewelers inthe world. 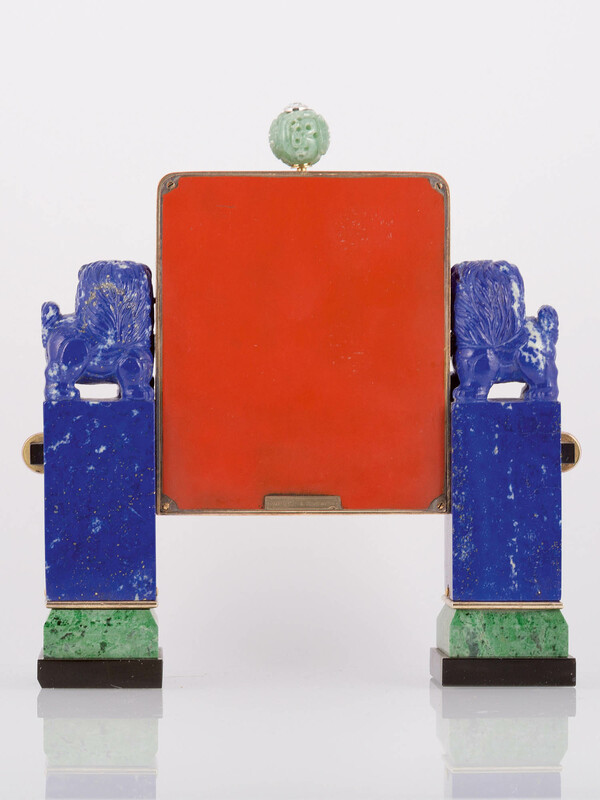 Having taken over Fabergé Londonworkshop in 1920, the firm gained popularity fortheir intricate designs, most notably with vanitycases, boxes and clocks. The present example, created at the HEIGHT of the firm's popularity andcreated in a pure Art Deco form, is a rare glimpse into the elegance of the Art Deco time. 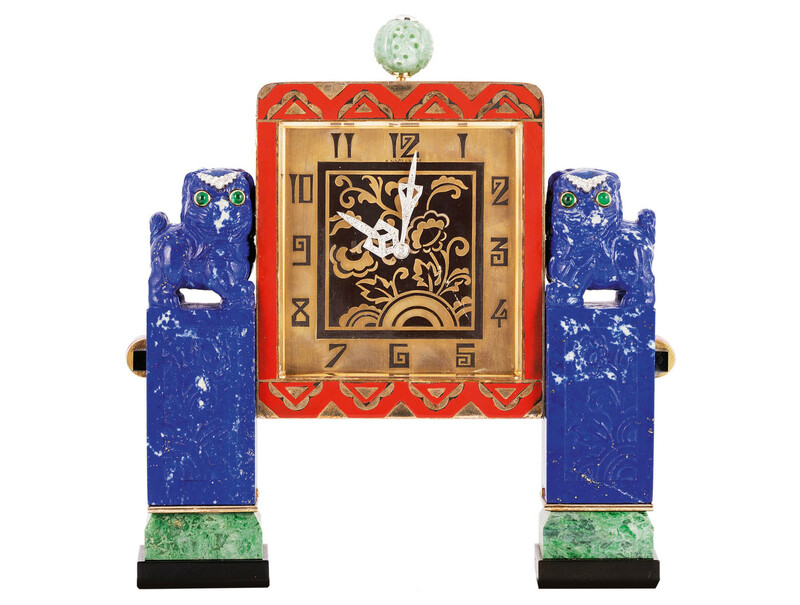 The square dial applied with black Arabicnumerals around a foliate design, surmountedwith a carved jadeite bead, the clock supportedby carved pillars composed of lapis lazuli, marble and onyx, inset with cabochon emeralds, accentedwith red enamel and rose diamonds, measuringapproximately 148 x 155 x 28 mm. dial signedJ. J. Lacloche, movement Vacheron & Constantin number 408025, signed on the reverse Vacheron& Constantin, inside caseback Verger Francemakers mark number 11366, fitted case stamped Jacques Lacloche. Copy of the certificate. 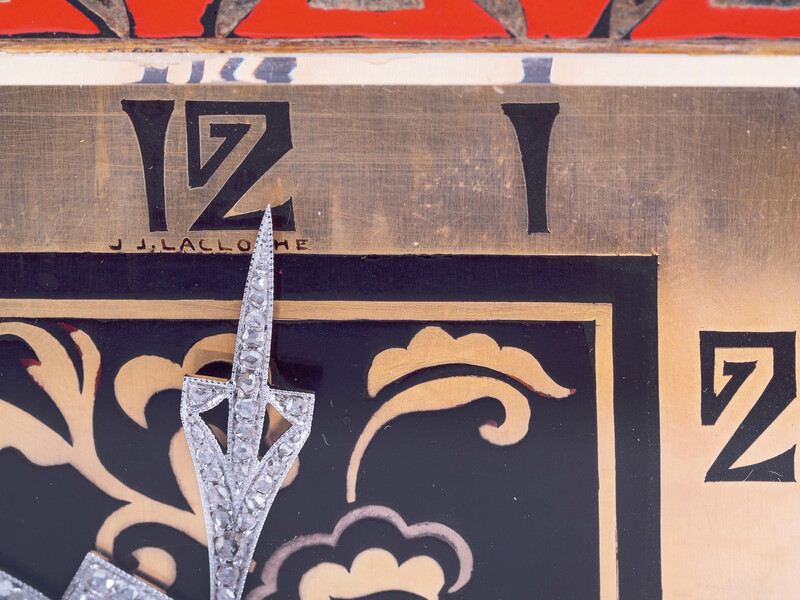 Superbe Horloge de bureau en émail et diamants, Jacques Lacloche, 1940. 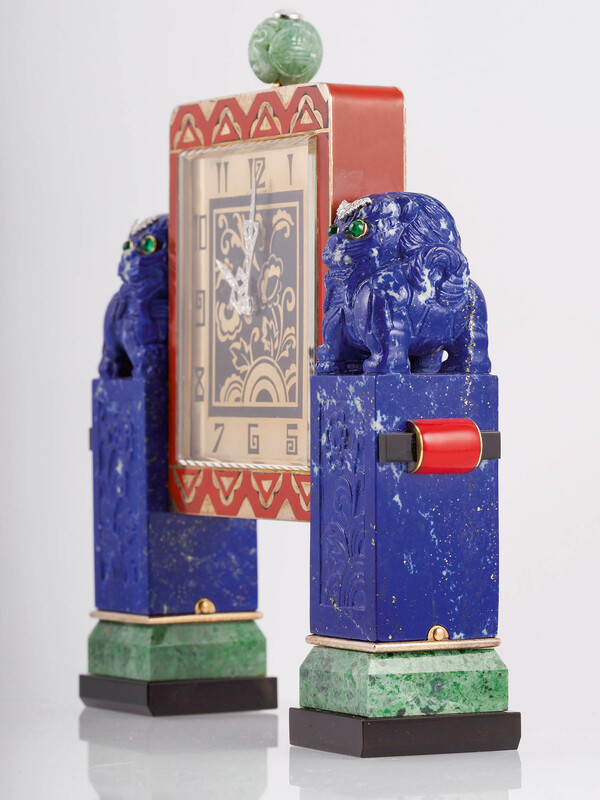 Le cadran carré appliquéde chiffres arabes noirs autour d'un motif foliaire, surmonté d'une perle de jade sculptée, l'horlogeest soutenue par des piliers sculptés composés delapis-lazuli, marbre et onyx, incrusté de cabochons d'émeraudes, accentué d'émail rouge et de diamantstaillés en rose, mesurant 148 x 155 x 28 mm. cadran signé J.J.Lacloche, mouvement Vacheron & Constantin numéro 408025, recto signé Vacheron& Constantin, intérieur de boîte mouvement avec poinçons et signatureVerger France numéro 11366, écrin estampillé Jacques Lacloche. Copie ducertificat.